Vive le choix, vive le hamburgé- Big Fernand, The French Burger Bistro, London UPDATE: Closed. First off Happy Christmas to everyone of my readers- I hope you are having a food and booze filled break (if celebrating). Anyhow onto the matter in hand, in my earlier years the New Year sales in London were a really big thing. Nutters (in my view) use to camp outside of the big stores days before and then there would be an unholy scrum (oldies equivalent of Black Friday) to get in the door and grab something generally not needed nor really wanted – but hey it was cheap. Never have or will understand this, but if you are up in the Big Smoke for shopping etc. up to or in the New Year and need to refuel, a burger is ideal fodder. 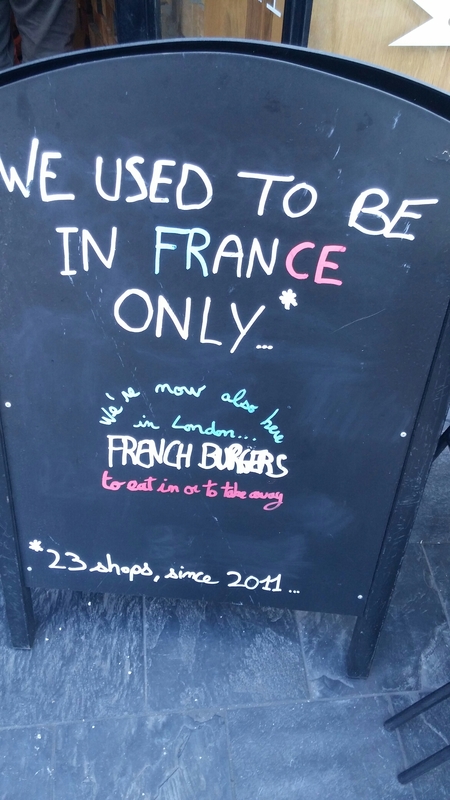 France is not a place I tend to associate with burgers. In fact the traditional view of France is of a Country that fiercely defends its culture against perceived Anglo – Saxon and, especially when it comes to food, US imperialism. Such US food imperialism is perhaps epitomised by McDonald’s and I certainly have an image in my mind of irate Frenchmen, wielding (in lieu of pitchforks) their beloved baguettes, marching on any accursed outlet of McDonald’s with the temerity to open in France. This is, however, a totally false perception as the French very much love a good (or even it seems a not very good one bearing in mind McDonald’s popularity) burger. Burger sales in France are rapidly approaching the levels of the iconically French ” le jamon beurre” – ham filled baguette (1.19 billion as against 1.23 billion in 2015) and over 75% of all French restaurants now sell burgers and 80% of these say that a burger is their top selling dish (according to a recent report). When it comes to McDonald’s, much to my amazement, there are more branches in France than the UK and France has the third largest number of branches per capita in the world (beaten only by the US and Japan). It is fair to say, therefore, that American style burgers and, in particular, McDonald’s have very much conquered France. Out of this love of burgers has, however, come a slew of homegrown French burger joints giving a French take on le burger. 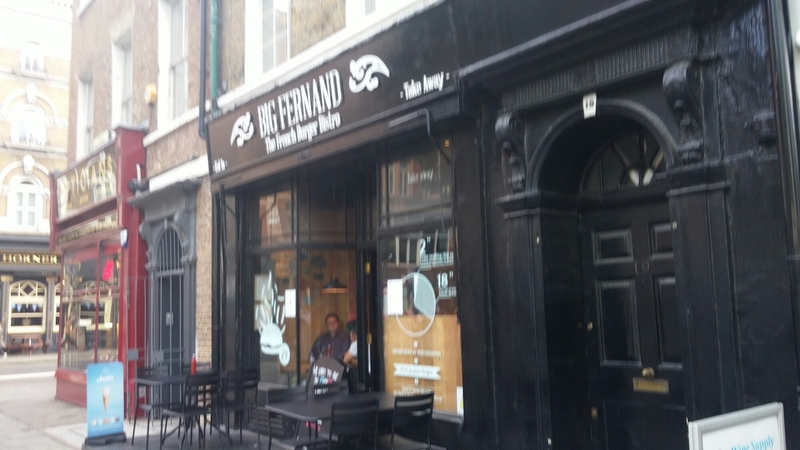 Such joints include the subject of this post – Big Fernand, which has made the jump across La Marche and set up an outlet in Royaume Uni. As part of my ongoing self appointed quest to find a favourite burger in London (ideal fodder for me as a quick bite before the train home after a meeting and great for a mid shopathon break), Big Fernand was an obvious choice. As I have said (many may argue harped on about) previously on this blog, I am very much of the view that a burger is best served medium rare. To me the key is choice. If you want a burger nuked that may not be my preference, but if that is your choice then you should be able to have it that way. My humble opinion is if an outlet wants to charge me a premium price for their burgers then they should have in place the necessary controls re sourcing and H&S management etc. 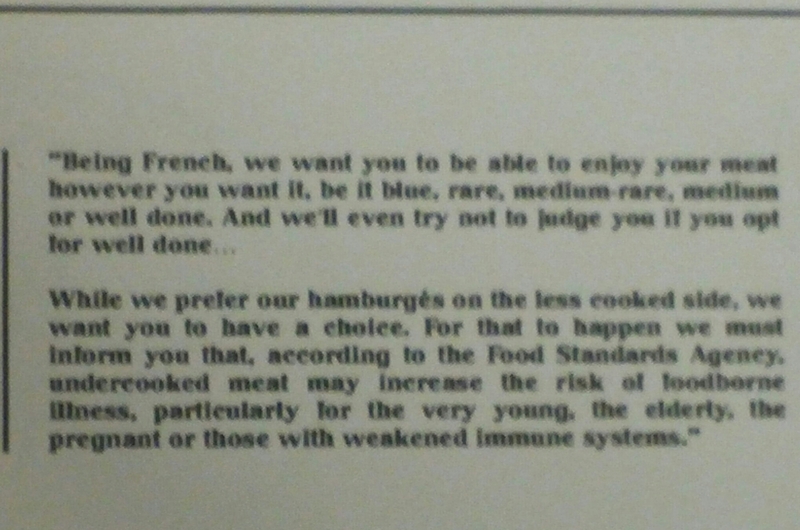 required by the FSA to enable them to offer me the choice as to how I want my burger cooked (be it blue, rare, my preferred medium rare or otherwise). I am aware of the risks (set out by people much more qualified than me) of less than well done burgers, but have been eating them all my life with no ill effects. There are risks in eating unpasteurized cheese, sugar, drinking alcohol or coffee, driving a car, crossing the road and many other things I do every week (I am pretty sure shopping other than for food or wine is very bad for my health – blood pressure tends to go through the roof). Apparently around 290 people die each year from the mere act of getting/falling out of bed – yet I do that every morning (getting – rather than falling out – that is, even though some days I really wish I didn’t have to). I choose to do these things and I choose to eat medium rare burgers. All I ask from purveyors of premium priced burgers is that they follow the enhanced FSA requirements (personally think all premium priced burger places should aim to follow these), cook my burger how I want it cooked and that the end product tastes good. 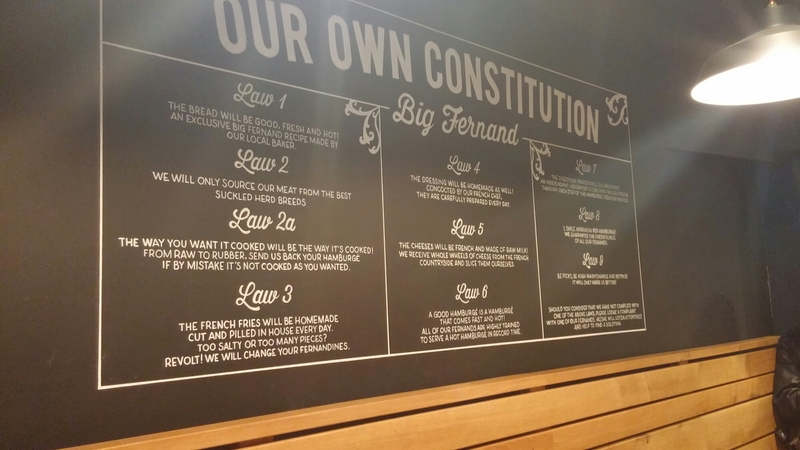 On the first two, Big Fernand gets a big tick in the box so how does it shape up on the third? Outside it is quite unassuming and you queue up to order and pay at the counter inside whether you eat in or take out. and up a lovely wrought iron spiral stairway, by way of stark contrast, is a room that is very old fashion (they call it granny’s living room). I like that you can see them cooking the burgers etc. They have a set of rules, which pleasingly centre on choice. Hamburgés (as they called their burgers) cooked as you like them being the central tenet. 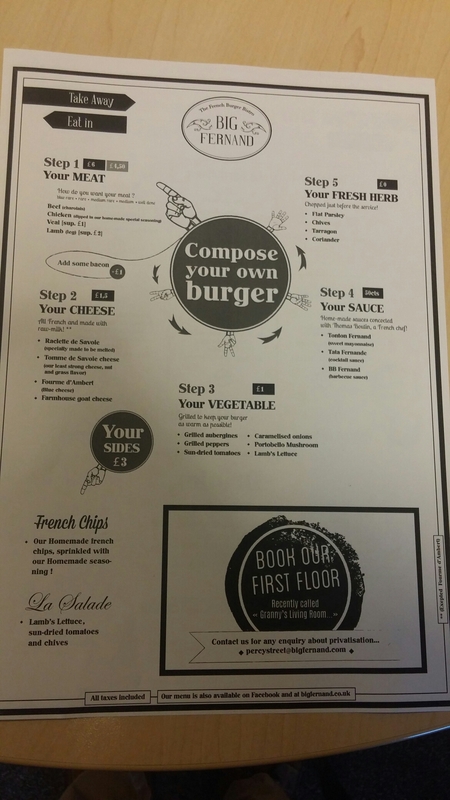 The menu provide for a number of in-house creations (covering beef, lamb veal, chicken and veggie), as well as the option to create your own burger. 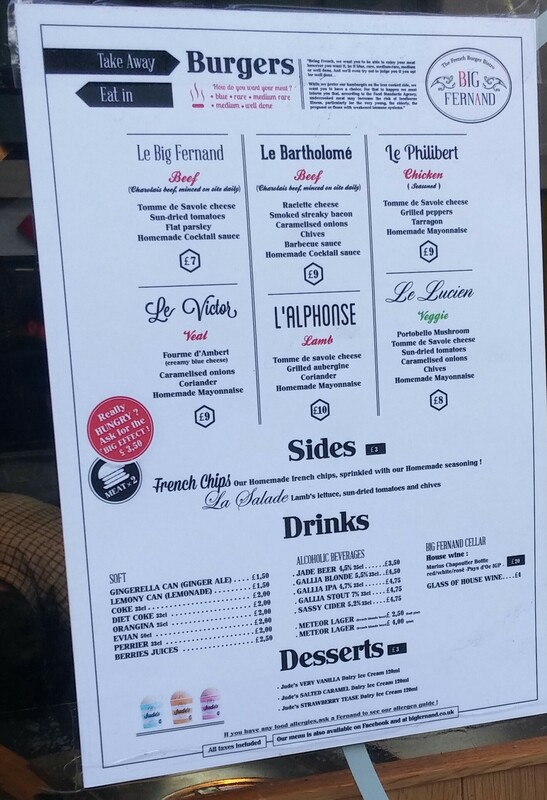 Lots of stuff is given a bit of a French twist, so the cheeses are French and unpasteurized (bien sûr) and the beef (minced in-house daily) is from Charolais cattle. 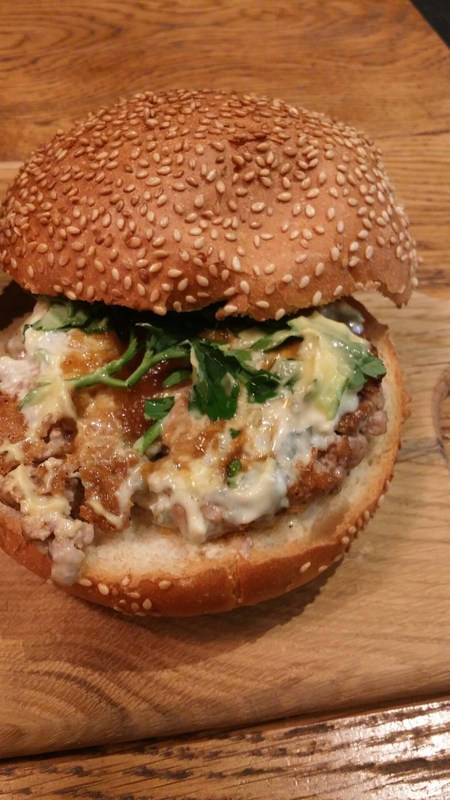 Whilst tempted by the beef based on a medium rare Le Big Fernand or a Le Bartholomé, it is a rare (medium rare of course) thing to find a veal burger in a burger joint (certainly in the UK). Loving the sound of it, I placed my order for Le Victor (£9) – medium rare – and chips (£3) and sat down to await my food. and took a bite. The veal patty had a lovely flavour and texture. Cooked à point for me, the patty was melt in the mouth stuff. Many may worry that the blue cheese it came with would overpower the veal, but the fourme d’ambert used here is a mild mannered blue. It had a pleasant tangy creaminess to it and the veal as a result held its own. Add to this a lightly toasted decent seeded “pain de mie” bun (interestingly, for a French place, they have not gone down the brioche route here), a good homemade mayo, sweet caramelised onions and coriander and you get a very superior burger to my mind. In comparison the French chips/ Fernandines (curiously not French fries) did disappoint slightly. Whilst tasty enough, with paprika salt liberally sprinkled on them, they were a bit floppy and lacked the crispness of a really good chip. 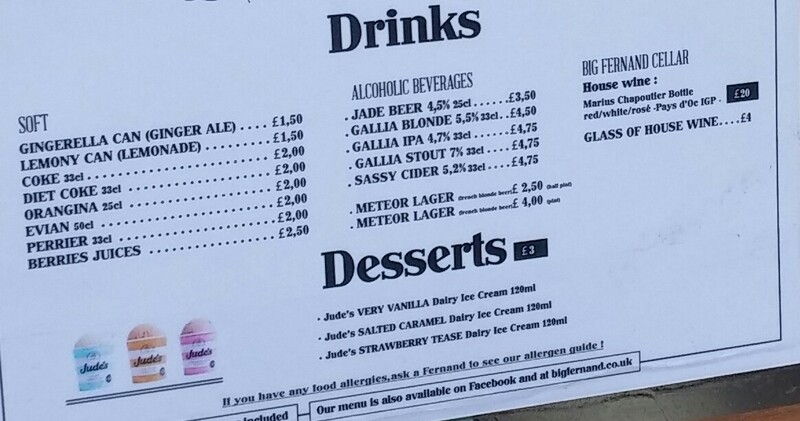 OK but no great shakes and pricey at £3 for not a massive portion. On the booze front they have a selection of French beers and interesting house wines (red, white and rosé) from the Chapoutier stable (a quality producer from top to bottom) in the form of their Marius by Michel Chapoutier range. Not too badly priced at £20 a bottle (retails at around the £10 mark) and £4 a glass. Tempted as I was by a glass of red, I had to work on the train back so no booze for me. On the soft drink front there are a couple of interesting options (and a few boring and quite expensive ones). Tap water is available and many dinners were taking this option on my visit (unsurprisingly perhaps when a 50 cl Evian is £2). 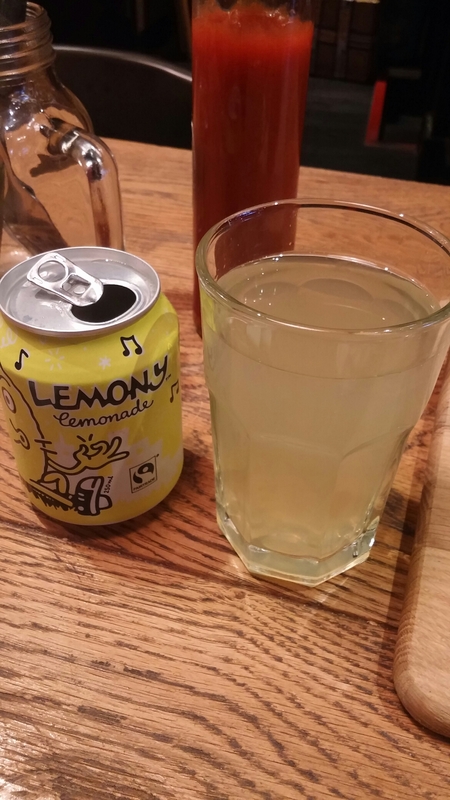 I went for the cheapish (in comparison), but dinky, lemony can (£1.50). This worked quite well in cutting through the richness of the burger. 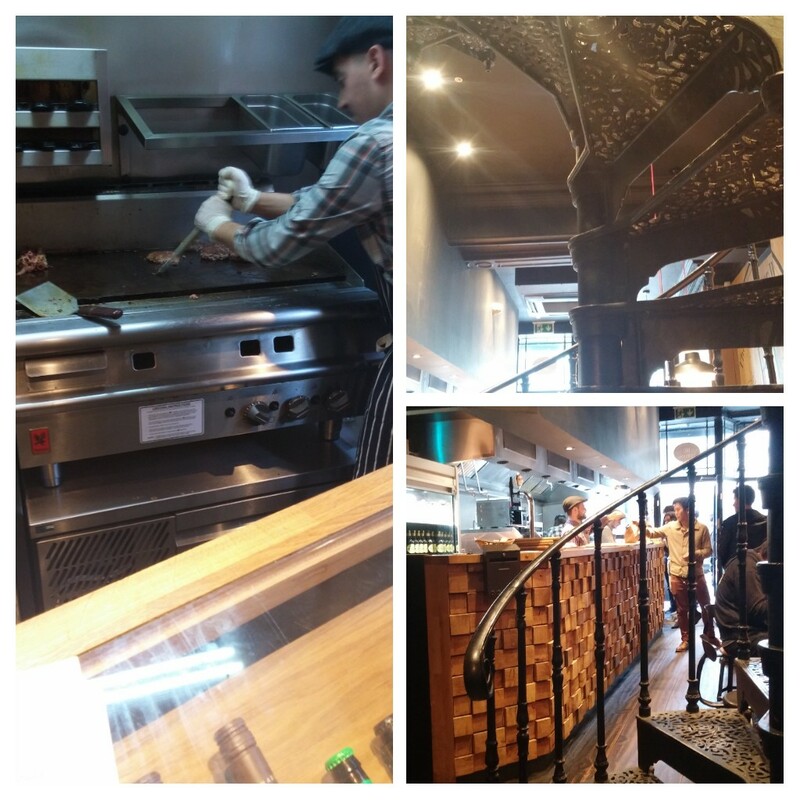 I rather liked Big Fernand. Anywhere that lets me decide how my patty is cooked and delivers on it, with a tasty burger or as they called it hamburgé is my kind of place. Whilst not faultless, as it is a bit pricey (l paid £13.50 all in) and the French chips are nothing to write home about, burger wise it is up there with or close to what so far are my top London burger joints (Patty & Bun, MEATliquor/MEATmarket, Honest, Tommi’s etc. – need to get around to trying Bleecker Street, Lucky Chip and Flip and Dip) and is boulevards ahead of the US imports in the form of Five Guys and Shake Shack. I noticed a Five Guys has opened between Big Fernand and Tottenham Court Road Tube. My advice is ignore its siren call of 250,000 so called choices (but not the most important one of how you want your burger cooked) and make Big Fernand le choix. A case of a very well done (if that is what you want) or rather “a point” burger for you whatever your preference. As the title suggests “vive le choix, vive le hamburgé”. 19 Percy Street, London, W1T 1DY. Closest tube station: Tottenham Court Road – 0.2 miles; Goodge Street – 0.2 miles. Opening hours: Mon – Tues: 12.00 – 21.30, Wed – Sat: 12.00 – 22.00. 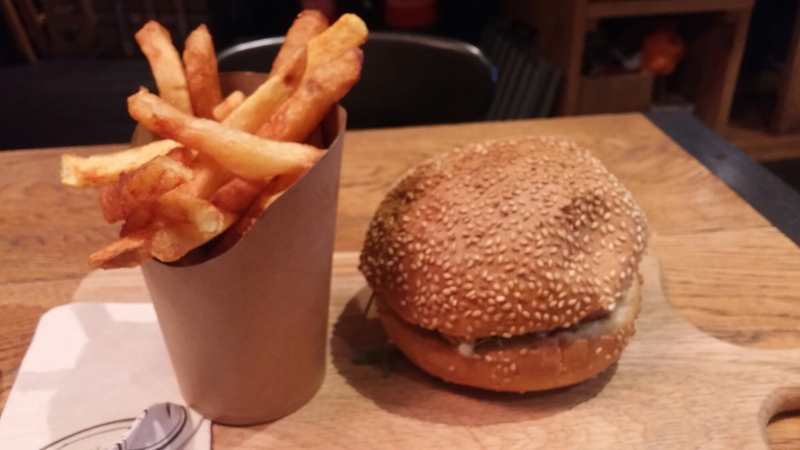 This entry was posted on Dec 26, 2016 by solicitingflavours in Alcoholic drink, Beer, Big Fernand, Burger, burgers, cheese, Drink, Dry white wine, Fast food, Food, Food and wine products, France, French wine, Ice cream, london, lunch, lunchtime, Non alcoholic drink, Outside Wales, Patty & Bun, Red Wine, Restaurant Review, review, Sandwich, Take away, Takeaway, veal, White wine.